Elder came to Wildlife Learning all the way from Rhode Island. 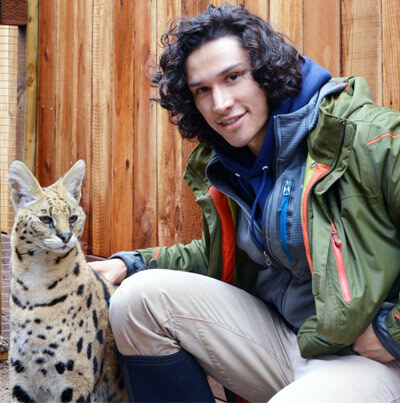 Having completed his Bachelor’s degree in Animal Science and Technology with a focus in Pre-Veterinary Medicine, Elder sought to apply his skill set and enthusiasm to an area that excited him both professionally and personally–with exotic animals. During his undergraduate career at the University of Rhode Island, Elder was hired as a research assistant to study the Haemonchus contortus parasite and its effects on small ruminants while providing support in formulating a natural anthelmintic. In the following years he pursued an opportunity as a veterinary technician working in a domestic animal clinic and later at an equine rehabilitation facility. Elder traveled to Guatemala to participate in a veterinary mission to reduce the population of feral dogs. As a fluent-spanish speaker, he provided aid in education outreach and assisted veterinarians with surgical spay/neuter procedures. Touring through Central America inspired Elder to apply for a Coastal and Environmental Fellowship. As a fellow he conducted avian research, particularly related to the the habitat selection of the Pipilo erythrophthalmus and the Scolopax minor. His interest and experience in wildlife led him to his current position as a wildlife biologist at Wildlife Learning Center. Elder hopes to educate the public about conservation and inspire our youth to explore the fascinating world of wildlife.